Glucose is a ubiquitous energy source in most organisms and plays a pivotal role in cellular metabolisms and homeostasis. Cancer cells exhibit increased glucose uptake to support their high proliferation rate. 2-NBDG (2-deoxy-2-[(7-nitro-2,1,3-benzoxadiazol-4-yl) amino]-D-glucose) is a fluorescent deoxyglucose analog that can be taken up by cells through glucose transporters. However, 2-NBDG cannot be fully utilized in glycolysis because of its modification and thus accumulates inside the cells. Fluorescence generated by this fluorescent glucose analog is proportional to glucose uptake by the cells and can be used to measure glucose uptake using fluorescent microscopy and flow cytometry. To validate the assay, the kit includes phloretin, a natural phenol that inhibits glucose uptake. This easy to use non-radioactive kit allows imaging and accurate measurement of glucose uptake in cultured cells in response to insulin, growth factors etc. Glucose uptake in Jurkat and HeLa cells. 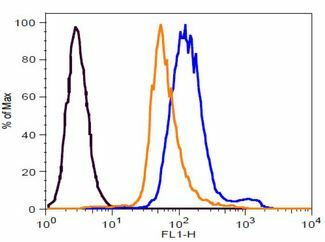 2.5E5 Jurkat cells were pretreated with or without 4 µl phloretin (1X concentration) for 45 min. After pretreatment, cells were washed and incubated with 2-NBDG Reagent, Glucose Uptake Enhancer, and the same concentration of phloretin for another 30 min. according to the kit’s protocol. 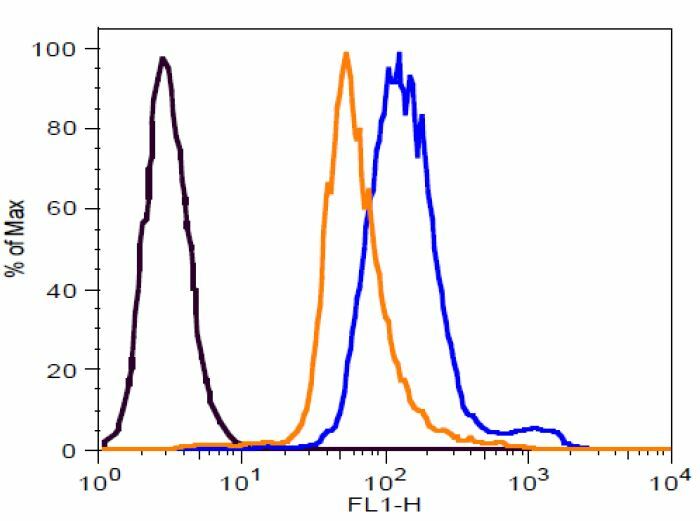 Comparison of histograms from flow analysis showing the inhibition of glucose uptake by phloretin in Jurkat cells (Black: negative control cells; orange: in the presence of phloretin; blue: without phloretin).